GBOX Squonker is a new squonk kit by Geekvape. 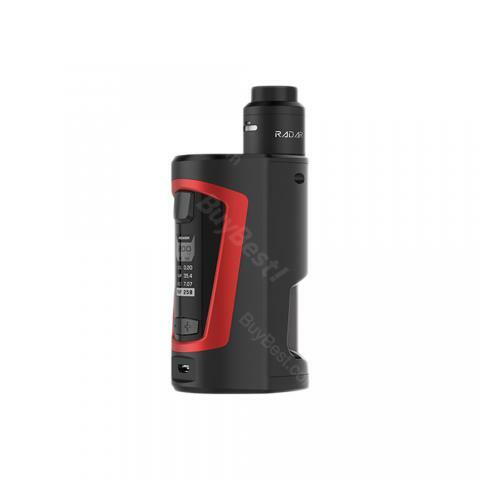 It features advanced AS chipset, which gives max 200W output and supports temperature control with TCR adjustments. Kit comes with Radar BF RDA. 4 colors available. • You can select extra 18650 battery separately. • You can select GBOX Squonker MOD, Radar RDA and Flask liquid dispenser. This small gadget looks absolutely fancy. It can offer authentic flavour and excellent vaping experience. Девайс мощный, красивый, производительный, с богатымм функционалами. Цена низкая! This is really a high-tech device, especially love the OLED screen, which can display all important data clearly and efficiently. I bought this army green atomizer. They offered a big discount and the quality is still guaranteed. The device I received was in good packing, great. Also, the GBOX Squonker looks good, and I am happy to receive it. That deck is pretty sweet. Who doesn't like more battery life and 8ml juice capacity is wonderful. The GBOX Squonker Kit is elegant, and I must add this to my collection. The tube for the bottle is an awesome design. Everything about this GBOX Squonker Kit is amazing. I definitely appreciate such a powerful squonker kit with two batteries.